And the responsible men of the Jews went on with their building, and did well, helped by the teaching of Haggai the prophet and Zechariah, the son of Iddo. 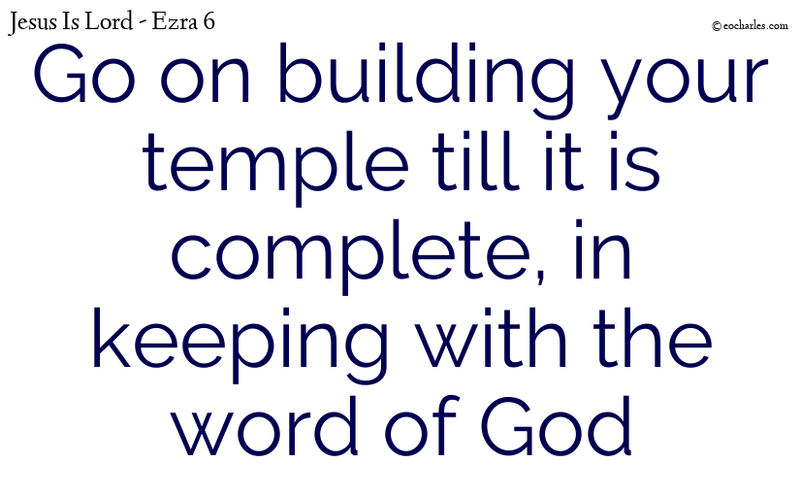 They went on building till it was complete, in keeping with the word of the God of Israel, and the orders given by Cyrus, and Darius, and Artaxerxes, king of Persia. God supplies all I need, poverty and lack have no control over my life. For all who feel burdened by poverty and lack. Another declaration of a received blessing, declare it! God shines before us, God shields us, we will never again lack glory, honor, abundance, riches, splendor, dignity, reputation and reverence. He Blesses us , because we trust in Him. 9)Psa 84:11 For the LORD God is a sun and shield: the LORD will give grace and glory: no good thing will he withhold from them that walk uprightly. God Lord Of Hosts, Bless Me And Supply All My Needs. I Will Not Lack, For I Have Plenty. I Will Not Lack, I Will Be Plenteous In Goods. I Will Not Lack, For I Will Have Plenty Of Silver. Abba, Thank You For Prospering Me Through Prophetic Ministry. Lord Of Hosts, You Supply Me With Glory, Honor, Abundance, Riches, Splendor, Dignity, Reputation And Reverence. Because I Trust In You, God Of Hosts. Lord Of Hosts, Thank You For Blessing The Man That Trusts In You. 9. ↑ Psa 84:11 For the LORD God is a sun and shield: the LORD will give grace and glory: no good thing will he withhold from them that walk uprightly.